For most of human history, though, that perspective has not been recorded. Going back to the theory of Man the Hunter, the lives of men have been taken to represent those of humans overall. When it comes to the other half of humanity, there is often nothing but silence. And these silences are everywhere. Films, news, literature, science, city planning, economics, the stories we tell ourselves about our past, present and future, are all marked — disfigured — by a female-shaped “absent presence”. This is the gender data gap. These silences, these gaps, have consequences. They impact on women’s lives, every day. The impact can be relatively minor — struggling to reach a top shelf set at a male height norm, for example. Irritating, certainly. But not life-threatening. Not like crashing in a car whose safety tests don’t account for women’s measurements. Not like dying from a stab wound because your police body armour doesn’t fit you properly. For these women, the consequences of living in a world built around male data can be deadly. The formula to determine standard office temperature was developed in the 1960s around the metabolic resting rate of the average man. But a recent Dutch study found that the metabolic rate of young adult females performing light office work is significantly lower than the standard values for men doing the same activity. In fact, the formula may overestimate female metabolic rate by as much as 35 per cent, meaning that current offices are on average five degrees too cold for women. This leads to the odd sight of female office workers wrapped in blankets in the summer, while their male colleagues wander around in shorts. Men and women have different immune systems and hormones, which can play a role in how chemicals are absorbed. Women tend to be smaller than men and have thinner skin, both of which can lower the level of toxins they can be safely exposed to. This lower tolerance threshold is compounded by women’s higher percentage of body fat, in which some chemicals can accumulate. In nail salons, where the workforce is almost exclusively female (and often migrant), workers will be exposed on a daily basis to a huge range of chemicals that are “routinely found in the polishes, removers, gels, shellacs, disinfectants and adhesives that are staples of their work”, according to the Canadian researcher Anne Rochon Ford. Many of these chemicals have been linked to cancer, miscarriages and lung diseases. Some may alter the body’s normal hormonal functions. If these women then go home and begin a second unpaid shift cleaning their home, they will be exposed to different chemicals that are ubiquitous in common products. Most of the research on chemicals has focused on their absorption through the skin. But many of the ones used in nail salons are extremely volatile, which means that they evaporate at room temperature and can be inhaled — along with the considerable amounts of dust produced when acrylic nails are filed. The research on how this may impact on workers is virtually nonexistent. The data gap when it comes to women in the workplace doesn’t only arise in female-dominated industries. Little data exists on injuries to women in construction, but the New York Committee for Occupational Safety & Health (NYCOSH) points to a US study of union carpenters that found women had higher rates of sprains, strains and nerve conditions of the wrist and forearm than men. Given the lack of data, it’s hard to be sure exactly why this is, but it’s safe to attribute at least some of the blame to “standard” construction site equipment being designed around the male body. In the UK, employers are legally required to provide well-maintained personal protective equipment (PPE) — anything from goggles to full body suits — to workers who need it, free of charge. But most PPE is based on the sizes and characteristics of male populations from Europe and the US. The TUC found that employers often think that when it comes to female workers all they need to do to comply with this legal requirement is to buy smaller sizes. Differences in chests, hips and thighs can affect the way the straps fit on safety harnesses. The use of a “standard” US male face shape for dust, hazard and eye masks means they don’t fit most women (as well as a lot of black and minority ethnic men). A 2017 TUC report found that the problem with ill-fitting PPE was worst in the emergency services, where only 5 per cent of women said that their PPE never hampered their work, with body armour, stab vests, hi-vis vests and jackets all highlighted as unsuitable. But although the complaints have been coming regularly over the past 20 years, little seems to have been done. British female police officers report being bruised by their kit belts; a number have had to have physio-therapy because of the way stab vests sit on their body; many complain there is no space for their breasts. This is not only uncomfortable, it also results in stab vests coming up too short, leaving women unprotected. On the face of it, it may seem fair to accord male and female public toilets the same amount of space — and historically, this is the way it has been done: 50/50 division of floor space has even been formalised in plumbing codes. However, if a male toilet has both cubicles and urinals, the number of people who can relieve themselves at once is far higher per square foot of floor space in the male bathroom than in the female bathroom. But even if male and female toilets had an equal number of stalls, the issue wouldn’t be resolved, because women take up to 2.3 times as long as men to use the toilet. Women make up the majority of the elderly and disabled, two groups that will tend to need more time in the toilet. Women are also more likely to be accompanied by children, as well as disabled and older people. Women may also require more trips to the bathroom: pregnancy significantly reduces bladder capacity, and women are eight times more likely to suffer from urinary-tract infections. In the face of all these anatomical differences, it would surely take a formal equality dogmatist to continue to argue that equal floor space between men and women is fair. In 1998, a pianist called Christopher Donison wrote that “one can divide the world into roughly two constituencies”: those with larger hands, and those with smaller hands. Donison was writing as a male pianist who, due to his smaller than average hands, had struggled for years with traditional keyboards, but he could equally have been writing as a woman. There is plenty of data showing that women have smaller hands, and yet we continue to design equipment around the average male hand. The average smartphone size is now 5.5 inches. While the average man can fairly comfortably use his device one-handed, the average woman’s hand is not much bigger than the handset itself. This is obviously annoying — and foolish for a company like Apple, given that research shows women are more likely to own an iPhone than men. The tech journalist and author James Ball has a theory for why the big-screen fixation persists: because the received wisdom is that men drive high-end smartphone purchases. But if women aren’t driving high-end smartphone purchases — at least for non-Apple products — is it because women aren’t interested in smartphones? Or could it be because smartphones are designed without women in mind? On the bright side, Ball reassured me that screens probably wouldn’t be getting any bigger because “they’ve hit the limit of men’s hand size”. When Zeynep Tufekci, a researcher at the University of North Carolina, was trying to document tear gas use in the Gezi Park protests in Turkey in 2013, the size of her Google Nexus got in the way. It was the evening of June 9. Gezi Park was crowded. Parents were there with their children. Tufekci wanted to document what was happening. So she pulled out her phone. “And as my lungs, eyes and nose burned with the pain of the lachrymatory agent released from multiple capsules that had fallen around me, I started cursing.” Her phone was too big. She could not take a picture one-handed — “something I had seen countless men with larger hands do all the time”. All Tufekci’s photos from the event were unusable, she wrote, and “for one simple reason: good smartphones are designed for male hands”. Voice recognition could be one solution to a smartphone that doesn’t fit your hands, but voice-recognition software is often hopelessly male-biased. In 2016, Rachael Tatman, a research fellow in linguistics at the University of Washington, found that Google’s speech-recognition software was 70 per cent more likely to accurately recognise male speech. Clearly, it is unfair for women to pay the same price as men for products that deliver an inferior service. But there can also be serious safety implications. Voice-recognition software in cars, for example, is meant to decrease distractions and make driving safer. But they can have the opposite effect if they don’t work. An article on car website Autoblog quoted a woman who had bought a 2012 Ford Focus, only to find that its voice-command system only listened to her husband, even though he was in the passenger seat. From smartwatches that are too big for women’s wrists, to map apps that fail to account for women who may want to know the “safest” in addition to “fastest” routes. While there are an increasing number of female-led tech firms that do cater to women’s needs, they are seen as a “niche” concern and often struggle to get funding. One study of 12 of the most common fitness monitors found that they underestimated steps during housework by up to 74 per cent (that was the Omron, which was within 1 per cent for normal walking or running) and underestimated calories burned during housework by as much as 34 per cent. Men are more likely than women to be involved in a car crash, which means they dominate the numbers of those seriously injured in them. But when a woman is involved in a car crash, she is 47 per cent more likely to be seriously injured, and 71 per cent more likely to be moderately injured, even when researchers control for factors such as height, weight, seatbelt usage, and crash intensity. She is also 17 per cent more likely to die. And it’s all to do with how the car is designed — and for whom. Women tend to sit further forward when driving. This is because we are on average shorter. Our legs need to be closer to reach the pedals, and we need to sit more upright to see clearly over the dashboard. This is not, however, the “standard seating position”, researchers have noted. Women are “out of position” drivers. And our wilful deviation from the norm means that we are at greater risk of internal injury on frontal collisions. Crash-test dummies were first introduced in the 1950s, and for decades they were based around the 50th-percentile male. The most commonly used dummy is 1.77 metres tall and weighs 76 kg; the dummy also has male muscle-mass proportions and a male spinal column. In the early 1980s, researchers based at Michigan University argued for the inclusion of a 50th-percentile female in regulatory tests, but this advice was ignored by manufacturers and regulators. 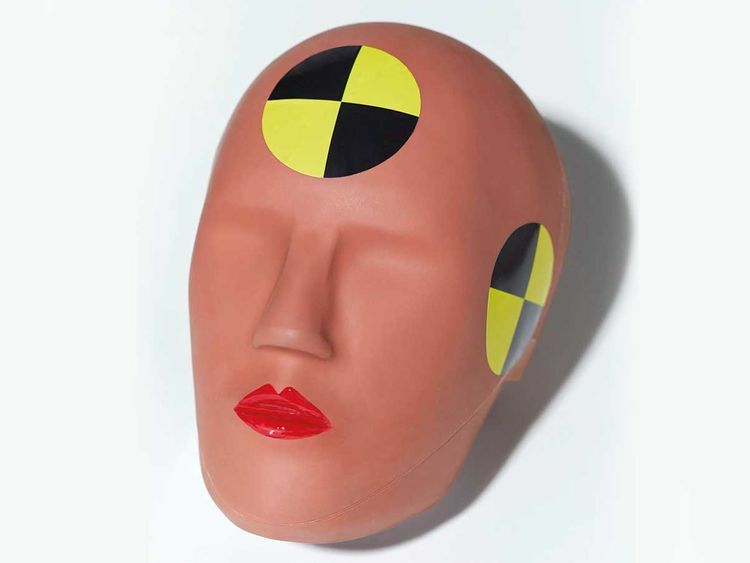 It wasn’t until 2011 that the US started using a female crash-test dummy — although, as we’ll see, just how “female” these dummies are is questionable. In 2018, Astrid Linder, research director of traffic safety at the Swedish National Road and Transport Research Institute, presented a paper at the Road Safety on Five Continents Conference in South Korea, in which she ran through EU regulatory crash-test requirements. In no test is an anthropometrically correct female crash-test dummy required. The seatbelt test, one of the frontal-collision tests, and both lateral-collision tests all specify that a 50th-percentile male dummy should be used. There is one EU regulatory test that requires what is called a 5th-percentile female dummy, which is meant to represent the female population. Only 5 per cent of women will be shorter than this dummy. But there are a number of data gaps. For a start, this dummy is only tested in the passenger seat, so we have no data at all for how a female driver would be affected — something of an issue you would think, given women’s “out of position” driving style. And secondly, this female dummy is not really female. It is just a scaled-down male dummy. Consumer tests can be slightly more stringent than regulatory ones. The 2011 introduction of female crash-test dummies in the US sent cars’ star ratings plummeting. 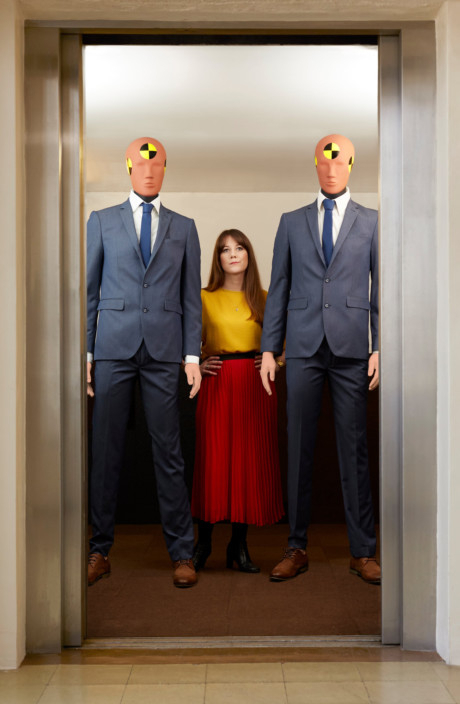 When I spoke to EuroNCAP, a European organisation that provides car safety ratings for consumers, they said that since 2015 they have used male and female dummies in both front-crash tests, and that they base their female dummies on female anthropometric data — with the caveat that this is “where data is available”. EuroNCAP acknowledged that “sometimes” they do just use scaled-down male dummies. But women are not scaled-down men. We have different muscle mass distribution. We have lower bone density. There are differences in vertebrae spacing. Even our body sway is different. And these differences are all crucial when it comes to injury rates in car crashes. Linder has been working on what she says will be the first crash-test dummy to accurately represent female bodies. Currently, it’s just a prototype, but she is calling on the EU to make testing on such dummies a legal requirement. In fact, Linder argues that this already is a legal requirement, technically speaking. Article 8 of the Treaty of the Functioning of the European Union reads, “In all its activities, the Union shall aim to eliminate inequalities, and to promote equality, between men and women.” Clearly, women being 47 per cent more likely to be seriously injured in a car crash is one hell of an inequality to overlook. This is an edited extract from Invisible Women: Exposing Data Bias in a World Designed for Men by Caroline Criado Perez (Chatto & Windus, £16.99).